As I mentioned in my first impressions of the 2013 Flower and Garden Festival, Disney has added the "Garden Marketplace" this year. Simply stated, it's a series of food booths featuring recipes that focus on fresh fruits, vegetables, and herbs. 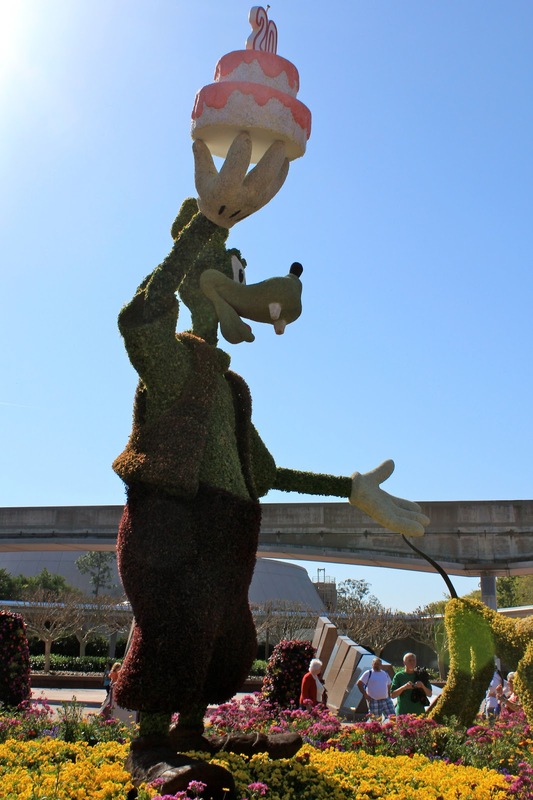 Although there are less locations than the Food and Wine Festival, the quality and variety of choices is still strong. Although I've only tried a couple of the booths so far, I can report that everything is delightful so far. 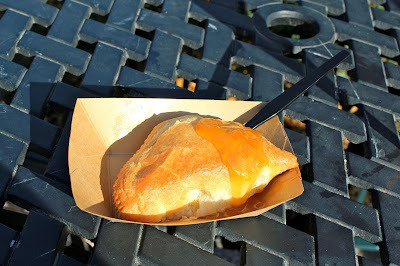 My first selection was the baked goat’s brie with kumquat chutney. For some reason I've always found the thought of cheese from goats to be unsettling, so I thought it was time to break that fear. I shouldn't have been afraid, as the mild flavor of the cheese was wonderfully offset by the sweet chutney. My wife actually ended up stealing this from me, as she wasn't a huge fan of her choice. 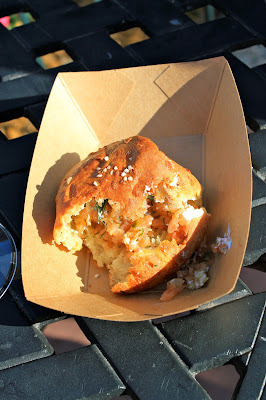 Thankfully, I loved the potato, chive and cheddar cheese biscuit with smoked salmon tartare and sour cream. The chives provided a strong herb flavor that balanced well with the cold salmon. I can understand why it might be overpowering for some, but it's still a wonderful choice. At the Mexico Pavilion, I tried the organic tequila flight, featuring Blanco, Reposado, and Añejo. In truth, I have extremely limited experience with tequila and can't make any serious judgements. 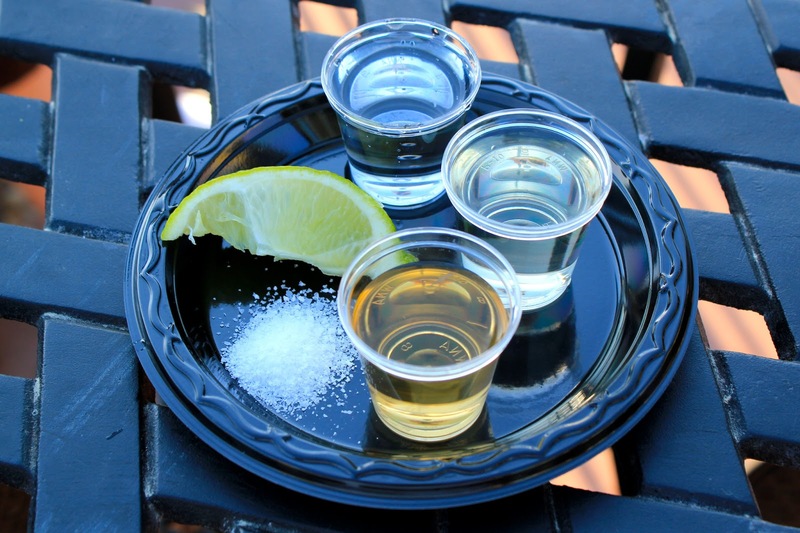 I will say that I enjoyed all three tequilas, and not just for the obvious reasons. They all had decent flavor, and the burning sensation was brief. Like I said, not the best judge of alcohol. 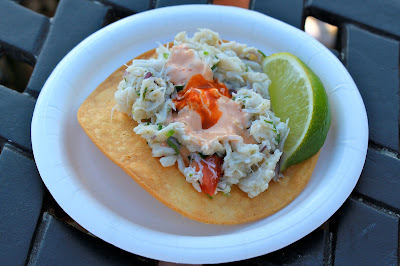 My favorite pick so far is the crab tostada with chipotle mayonnaise and valentina sauce. The spicy sauces are a perfect compliment to the crab, and a side of lime adds some citrus kick. I definitely plan on getting it again, as my only two complaints about it are that it's too messy, and there isn't enough of it.